Rendering of Hanover high-rise residential tower proposed for Kirby Drive in Houston. HOUSTON – Hanover Co. is planning to build a high-rise residential tower on Kirby Drive, just north of West Alabama Street in the Inner Loop of Houston. The project is expected to be more than 30 stories tall and contain more than 300 apartment rental units, according to a report by Nancy Sarnoff in the Houston Chronicle. The tower will include street level retail and will have frontage on Kipling, Steel and Kirby streets. Hanover is under contract to buy the 1.65-acre site and should be ready to begin construction in 2015, Hanover’s David Ott told the Chronicle. Architecture is by Solomon Cordwell Buenz. Hanover is also developing a high-rise residential tower on San Felipe Road in Uptown as part of Ed Wulfe’s BLVD Place. 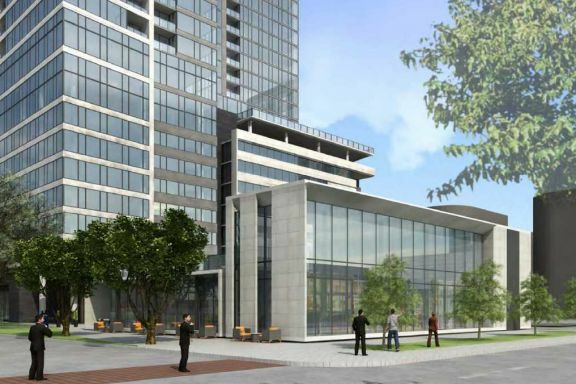 And Hanover is developing a tower on Montrose Boulevard at Hawthorne Street, just south of Westheimer.